O'Neill, Wallace & Doyle, P.C. O'Neill, Wallace & Doyle was founded in 1976 with the singular purpose of providing thorough and aggressive representation in defense litigation. Through our commitment to providing proven results and staying ahead of the curve on changes to the law, OWD evolved into the standard for effective representation specializing in litigation, as well as pre-litigation and consultation services for all aspects of insurance defense, municipal law and business law. With offices in Saginaw, Flint and Petoskey, OWD's attorneys are specialists in multiple areas of the law to satisfy your legal needs throughout Michigan. Please click on the Specialties tab for more information about our areas of expertise and see our map for locations and contact information. Let OWD respond to your legal concerns by furnishing effective, efficient legal counsel. 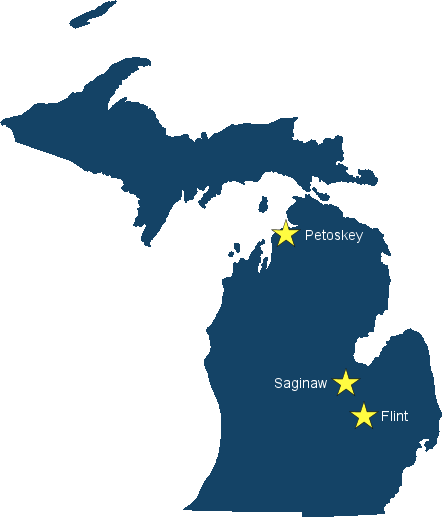 Serving All of Michigan, from our offices in Saginaw, Flint and Petoskey.